The church of St. Anna is a small Gothic church (later Baroquinised) in one of Vienna′s most central locations: Just off the Kärntnerstraße in the first district or Innere Stadt. Nevertheless, the Annakirche is widely ignored by most of the touristy crowds that rush by on the busy shopping lane. The core of the current church of St. Anna was first built in 1320 as a chapel of the Clarissian nuns. It was probably part of a hostel run for pilgrims. Later, the church was run by the Jesuite Order. The Gothic foundations are fairly easily recognised from the outside; if you stand inside of the church, you will have a harder time to grasp why this building started out as a Gothic one. 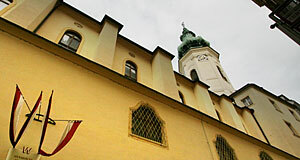 The entire church of St. Anna was transformed into a Baroque church between 1629 and 1634 - in the process of this move, the church gained its tower. After a disastrous fire in 1747, the church was remodelled once again - this time in late-Baroque style. This added the relative uniformity that you find in today′s Annakirche beyond the foundations. The architect in charge was Christian Tausch. "Tausch" means exchange in German, so the name is rather appropriate given that he changed the style of the church rather efficiently. Today, the interiors of the church are dominated by the tabernacle. The main nave as three side-chapels on each side; the first one on the left side is dedicated to St. Franz-Xaver. It is slightly bigger than the other chapels and archaeologists assume that it comprises of the original chapel of St. Anna. So what about the lady of the house? St. Anna can be found above the entrance, in a "Anna Selbdritt" depiction with her daughter, the Virgin Mary and her grandson Jesus. The statue dates back to the 17th century. But wait, there′s more - on the 26th of July, the day of St. Anna, the church celebrates an annual ceremony. Upon this occasion, a special relic that is the property of the church is presented to the worshippers: A mummified hand, said to be one of only two hands that were once used by St. Anna. The Annakirche is overshadowed by high buildings that surround it; the building is now incorporated into a block of buildings. It is not always open, but worth a closer look when it is. Attractions nearby are numerous (the Annakirche is in the first district, after all), so I name only the closest ones: The Malteserkirche around the corner, the House of Music, the Ronacher and the Ursulinenkirche; the Staatsoper (National Opera), the Neuer Markt and Kaisergruft Imperial Tomb; the Stephansplatz, Graben, Pestsäule and Haas Haus; the Deutschordenskirche and Albertina.